Sanyo just announced a new Xacti camcorder that looks interesting due to the way it breaks from the company’s typical pistol-grip style camcorders and due to its lens. The VPC-PD2BK has a form-factor more like the Flip-style cams, but with a 3x zoom lens that looks like it came from a compact still digicam, therefore also featuring a faster maximum aperture of f/3.1 than on their pistol-grip style cams which usually start at f/3.5. Every little extra bit of light gathering helps. As I’ve noted before, while I really like my Xacti VPC-GG10, I find that it’s lens is not up to the standard of the average digicam. In everyday use this matters less for video than for still pictures. But this better looking lens on the new PD2 gives me some hope that perhaps this cam will deliver better stills alongside full 1080p HD video (alas, only at 30 fps, rather than the cinema standard of 24p). 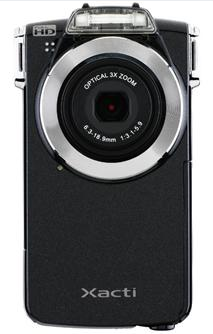 The PD2 also doesn’t include a mic jack or optical image stabilization–two features which would be very welcome. But at a pre-order price of $169 over at Amazon, if the quality matches or betters the VPC-CG10 (which is what I’d hope), the PD2 may still be a very appealing option for videographers looking for more flexible image control than available with the typical Flip-style cam.